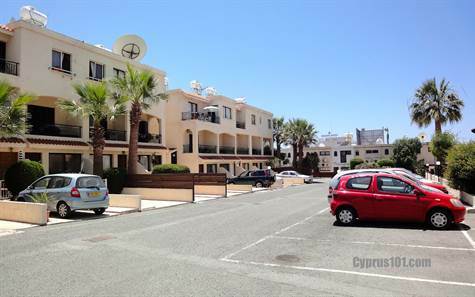 Cyprus Property Blog by Cleo : Just Listed - Kato Paphos apartment for sale - Gated Community - Great price! Kato Paphos, Paphos - Situated in a gated community, this two bedroom ground floor apartment is located in the very popular touristic area of Tomb of the Kings. A variety of local amenities such as shops, restaurants, bars and banks are within easy walking distance and this is an ideal location for those wanting to live or holiday without needing the use of a car. The bus stop is a short stroll away. The apartment features an open plan living room with lounge and dining area. Patio doors open on to a good size covered veranda. Through an archway is a fitted kitchen with white units, cooker, microwave, fridge/freezer and washing machine. A private veranda is accessed directly from here which is ideal for outdoor dining and relaxing. Off the living room is a hallway leading to two double size bedrooms with fitted wardrobes and a good size shower room. Tucked away in one corner of the complex is the communal swimming pool with surrounding terrace for sunbathing which is well maintained and available for use by residents only. There is plenty of parking available. The apartment is offered fully furnished and is ideal as a holiday/rental investment. There are full title deeds.